I am a side sleeper...at least I am a side sleeper when I do not have a baby sleeping on my chest. 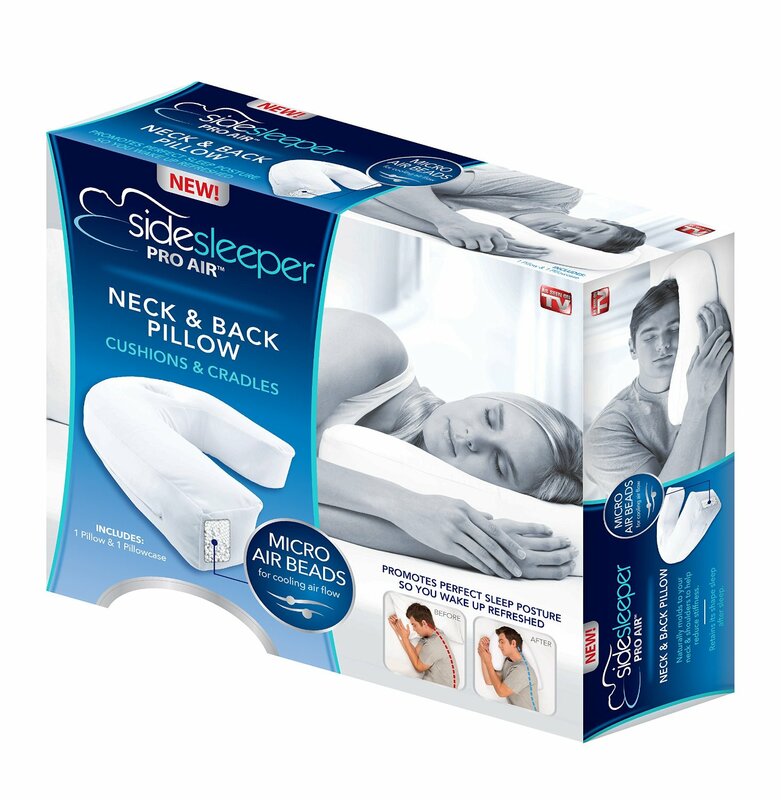 I was recently lucky enough to receive a pillow made especially for me and other side sleepers called the Side Sleeper Pro Air Pillow and it is pretty amazing! It is filled with beads and really conforms to your neck and shoulders to fully support your body and is so comfortable to cuddle into! There is also a place for your ear so you fit even more comfortably on the pillow. It is perfect for the side sleeper like me who loves something to hold onto. I often have to use two pillows for my head, one for me to hug and another between my legs. This does not work well for us because we have toddlers in the bed with us. This pillow takes up a lot less room and is even more comfortable than a "normal" pillow! The Side Sleeper Pro Air is the unique new therapeutic pillow that will truly change the way you sleep. The Side Sleeper Pro Air pillow is filled with luxurious air beads that cushion and cradle your body to give you an incredible night's sleep every night. By supporting your neck, shoulders and spine, the Side Sleeper Pro Air pillow softly helps guide your body into perfect alignment so you'll wake up fully refreshed and ready for the day ahead. Its shape was designed to make adjusting to side sleeping easier and more comfortable. It puts you in the correct side sleeping position to minimize unhealthy sleeping. Aids in a reduction of body aches and pains, less snoring and a more comfortable nights sleep. This incredibly comfortable pillow is offered at less than $30 and shipped free and fast with Amazon prime, so it is perfect for a Christmas present! I highly recommend it because it is so comfortable and squishy. WARNING: your loved one might never want to get out of bed when they received this on Christmas morning!